Submitted by Staff Picks on September 19, 2018 @ 11:31am. FIELD of PONIES is back with new drop at the Phi Boutique. The brains behind the project Julie Bérubé shot the pieces on local babe Rosewhatever last summer, and we can't get enough. 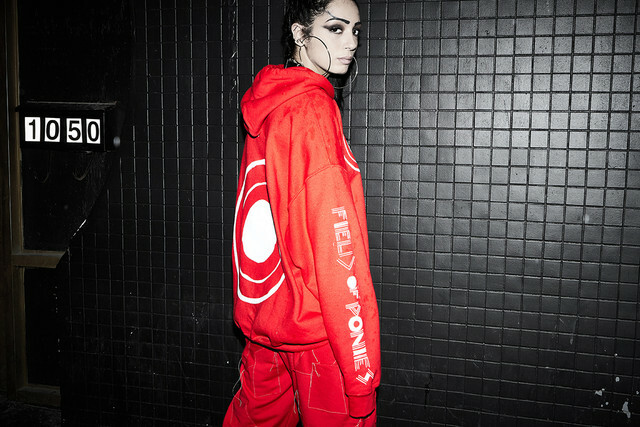 FIELD of PONIES is an independent London based label, which embodies a post-apocalyptic take on fashion. The brand uses current street wear trends to distort our reality and project an aesthetic that is both distorted and humorous. The concept of FIELD of PONIES is drawn from reflections on civilisation and the belief that we are witnessing the imminent implosion of its current value systems. One area of reflection in particular is the meaning of fear. As we are currently witnessing in mainstream media, fear is being used to alienate us from living a life that is rich in experiences and accepting of others. At FIELD of PONIES, we believe that fear can be used as a powerful creative tool that can actually empower each one of us even in the darkest moments.